Nope, they aren’t buttermilk pancakes (which are always the best), but these cook up so fluffy and delicious, no one will ever know the difference. The best part is you don’t need any special ingredients. 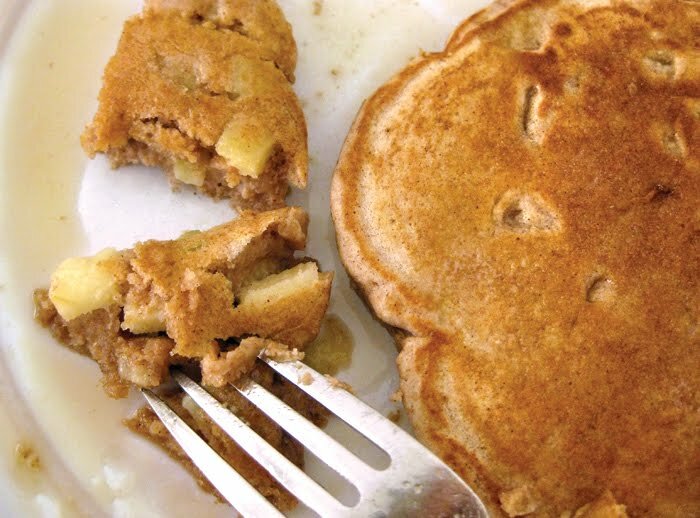 If you keep whole wheat flour in your pantry and have an apple on hand, you’re all set. No buttermilk, no needing to make your own buttermilk, no yogurt — just the basics. Easy-weasy-japanesey, as my high school geometry professor used to say. *I like to use raw sugar when baking, but regular granulated sugar will work as well. If you prefer a slightly sweeter pancake or like to eat them without syrup, increase the sugar to 3 or 4 tablespoons. In a small bowl, lightly beat the egg, milk and oil. Set aside. In a large bowl, mix all the dry ingredients. Add the egg mixture all at once to the flour mixture and stir until just moistened (the batter should be a little lumpy). Gently stir in the apples until all are coated. The key to keeping these light and fluffy is not overmixing the batter. Pour 1/4 or 1/3 cup of batter onto a lightly greased skillet over medium heat. This is a thick batter so you may need to spread it out a little. Cook for about 2 minutes on each side or until pancakes are golden. You know they are ready to flip when bubbles begin to rise to the surface and the edges begin to look dry. Keep cooked cakes warm in a 200° oven if making a large batch at once. Serve warm with butter and pure maple syrup, mmmm mmmm! This recipe makes about 16 4-inch pancakes, so it’s enough for a crowd, but you can also store the batter covered in the refrigerator and cook them up throughout the week like I do. You can also half the recipe if desired. For the few tricky measurements, here’s a couple guidelines: 1 tablespoon = 3 teaspoons; and for the egg, you can beat one egg and use half or use a small egg. Either works just fine. YUM!! Look forward to trying these! They sound wonderful. I'll make these this weekend. I just printed this recipe – I'm going to make them for the boys tomorrow morning! printed the recipe – and I think I just might make them this week-end….yummy!